The "Colorado Eight" had been part of an intensive breeding program similar to a puppy mill, with little regard for the animals' health or welfare. The facility made money by offering the public the opportunity to handle tiger and bear cubs for a fee. 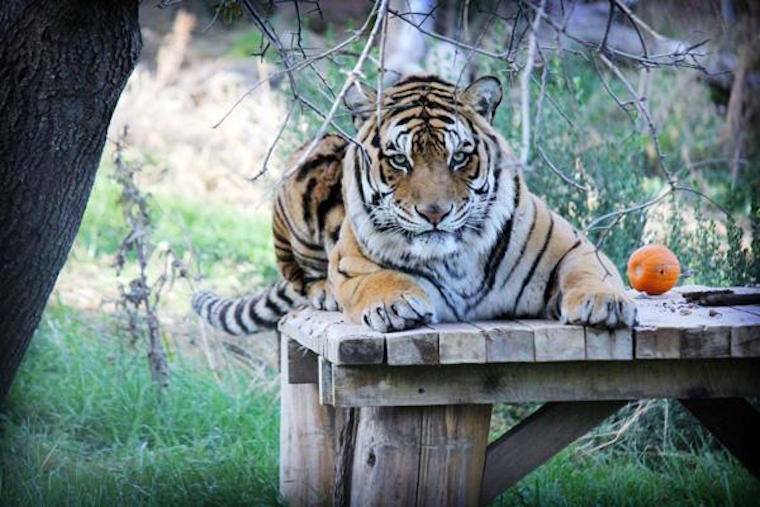 In early December 2016 PAWS received word that more than 100 animals were in need of immediate placement in new homes after a roadside zoo in Colorado ceased doing business. 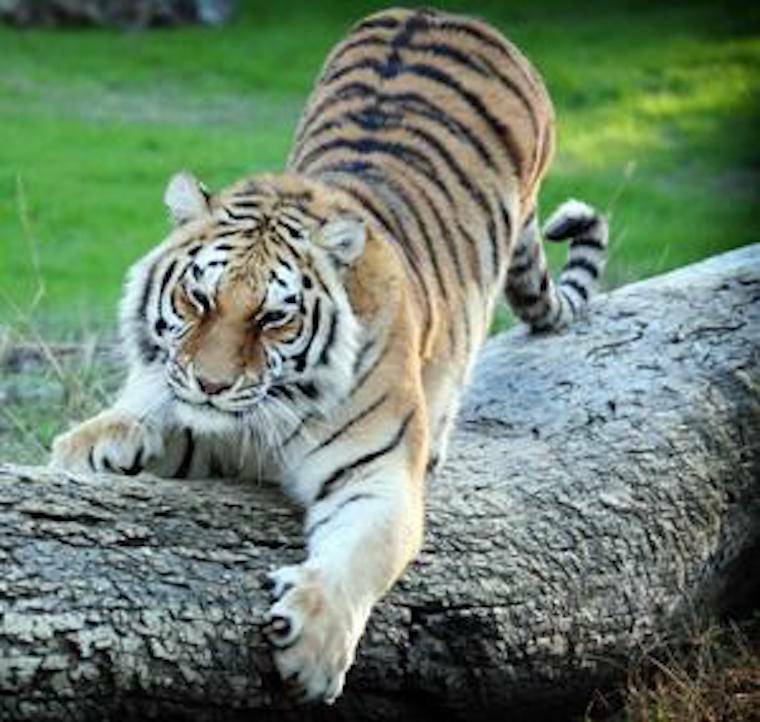 Several reputable sanctuaries throughout the U.S. stepped up to provide lifetime care for the animals from this rescue, with PAWS accepting eight tigers. 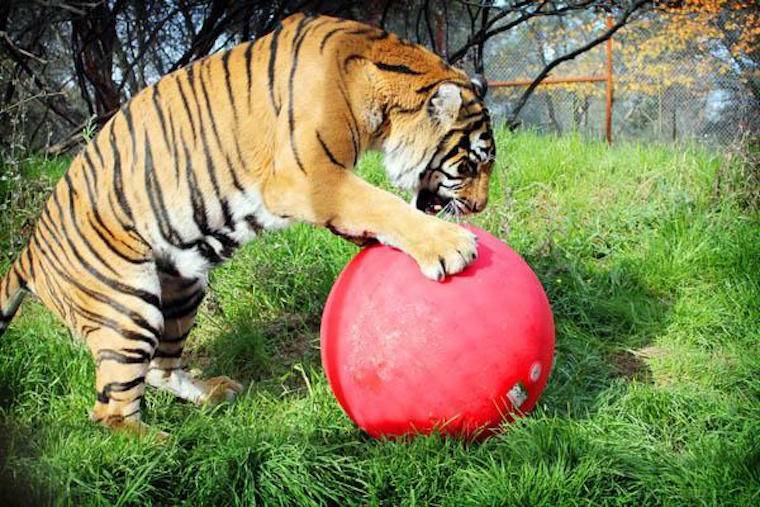 Preparations to accommodate the tigers at PAWS' ARK 2000 sanctuary began immediately and included the construction of new enclosures. 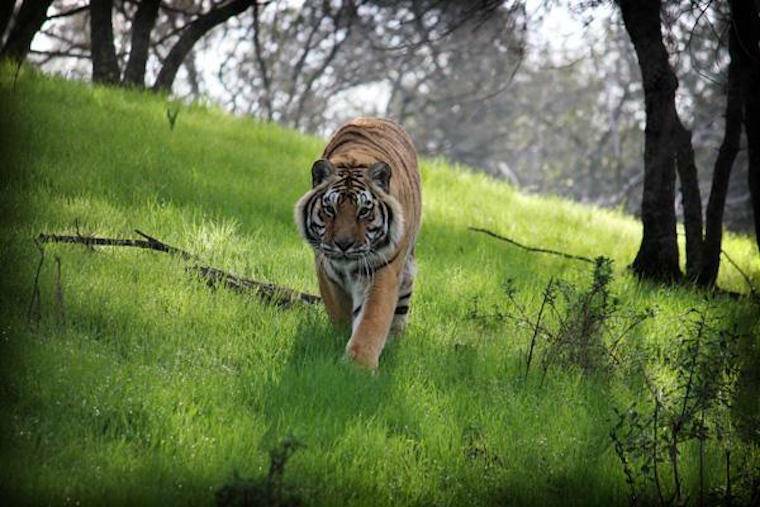 The first four tigers arrived at PAWS on New Year's Eve 2016, with the remaining tigers arriving on February 10, 2017. The "Colorado Eight" had been part of an intensive breeding program similar to a puppy mill, with little regard for the animals' health or welfare. The facility made money by offering the public the opportunity to handle tiger and bear cubs for a fee. To ensure a steady supply of cubs for photo and "play" sessions, these "pay-to-play" operations constantly breed the animals, producing litter after litter. Cubs are forcibly removed from their mothers soon after birth to make them more manageable. Young and vulnerable cubs are passed from person to person, often roughly handled during play sessions, and may be physically harmed. Cubs who are removed from their mothers at birth miss out on important antibodies that they should be receiving from mother's milk, and as a result their weakened immune systems leave them completely vulnerable to deadly infections. Cubs that manage to survive this horrifying start to their lives quickly grow too big to be handled, and are immediately put into the breeding population to create even more cubs or sold to private owners or other roadside zoos. This hellish, self-perpetuating cycle is found wherever tiger and bear cubs are subjected to public handling. Despite grandiose and deceptive claims, these irresponsible captive breeding programs have no conservation value, and none of the bears or tigers produced will ever be released into the wild. As PAWS welcomed these new tigers into sanctuary a year ago, we celebrated their symbolic rebirth into a new life where they are treated with respect, and where their dignity and individual needs are honored. Former, and sometimes derogatory, names were changed to reflect their new lives. During their daily interactions with these tigers, PAWS' expert caregivers have gotten to know each one's personality and preferences. Our veterinarians check on them regularly and tailor treatment plans to each cat's needs. 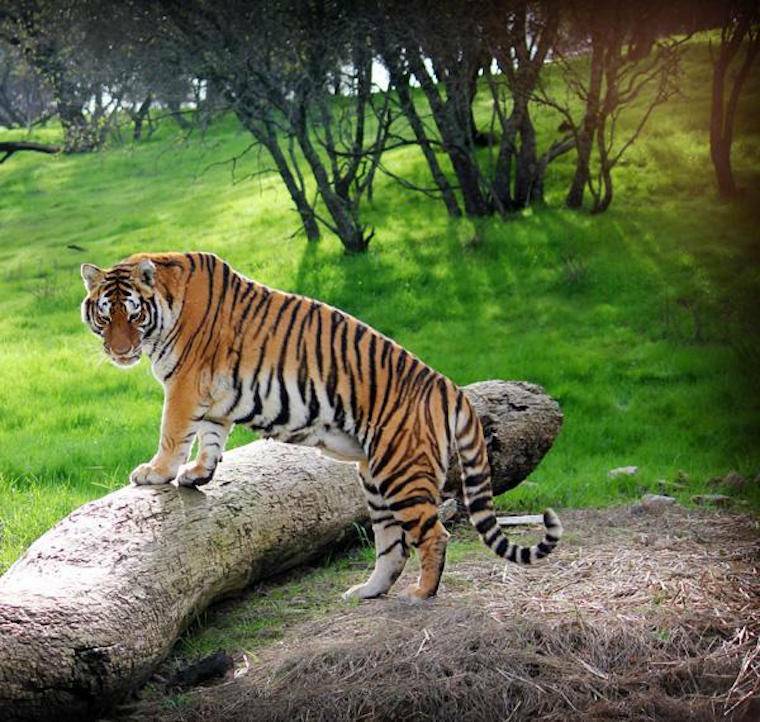 All eight tigers have settled in well, and enjoy exploring large, grassy habitats as well as napping in the sun while listening to the peaceful sounds of nature at ARK 2000. 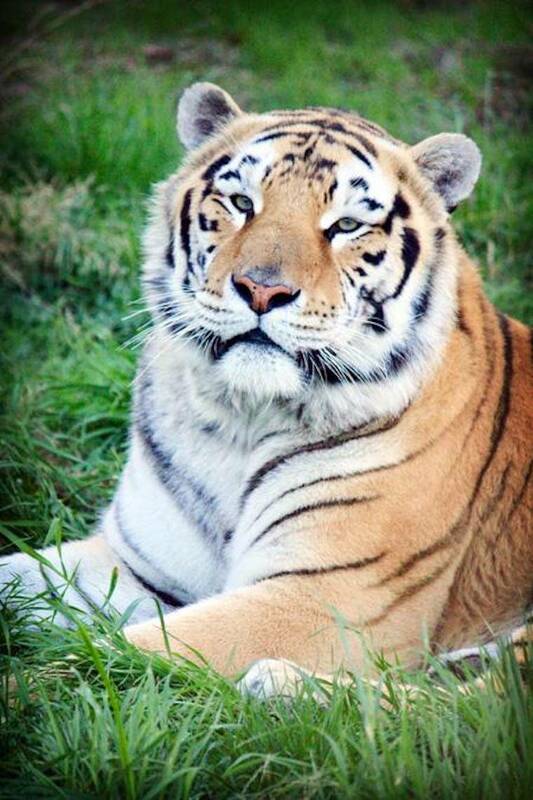 Marin, a 19-year-old female, is described by tiger supervisor Renae as "spunky" and "talkative." She enjoys lounging in the tall, green grass of her very own habitat, as well as bouts of play with her large red ball (right) that was provided by a generous Amazon Wish List donor. Marin has a beautiful face and a richly-colored coat, and greets caregivers with unique, friendly vocalizations. It is heartwarming to see her relaxed and content, far from the chaos and stresses of her previous home. At 19, she is considered elderly, so special considerations have been made to support her health. Pharaoh is a 14-year-old neutered male. When he arrived at PAWS he was noticeably thin, with a personality best described as volatile and nervous. As Tiger Supervisor Renae got to know him, she worked hard to create situations that made him feel safe. Despite eating large meals, he remained thin and always seemed hungry. PAWS' veterinarians performed a comprehensive physical examination under anesthesia, and discovered that he was not absorbing nutrients normally in his GI tract, which was probably the major reason for his ravenous appetite and near constant agitation. Since that exam, Pharaoh has been receiving special vitamins and other nutritional support and he is now a completely different tiger. He has put on weight and is much calmer and more confident, and he has found a new friend in Renae. Sawyer is a 10-year-old female. At her former home, she was forced to have multiple litters of cubs which were taken away from her soon after birth. 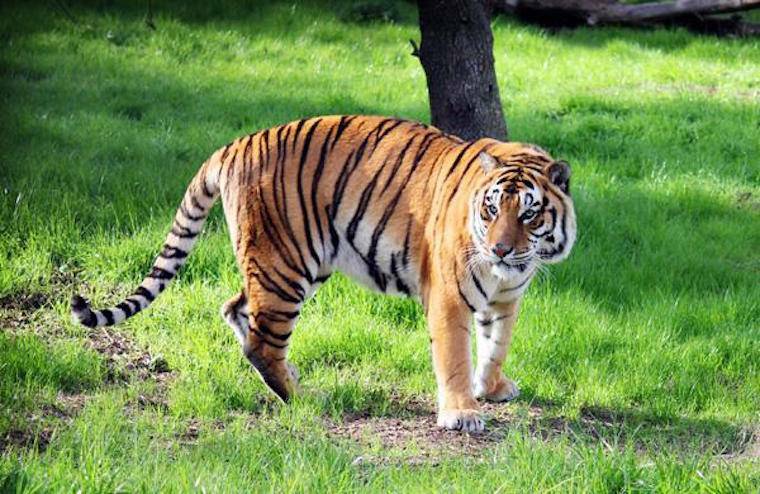 Unspayed female tigers can develop cancer and infections in their reproductive tracts, and hormones produced when they are in estrus can cause fighting and other undesirable behaviors in other tigers nearby. Sawyer underwent an ovariohysterectomy (spay surgery) in November 2017 in the recently opened Pat Derby Animal Wellness Center at ARK 2000. Dr. Margo Mehl, a board-certified veterinary surgeon and PAWS supporter, generously donated her services. While Sawyer was under anesthesia, PAWS' veterinarians collected samples from some unusual areas of skin, and diagnosed a condition which will require treatment. Today, Sawyer is calmer and quite friendly, approaching keepers and vets alike with a cheerful "chuff" and fence rub. Bigelow, Wilhelm and Nimmo are 7-year-old brothers. 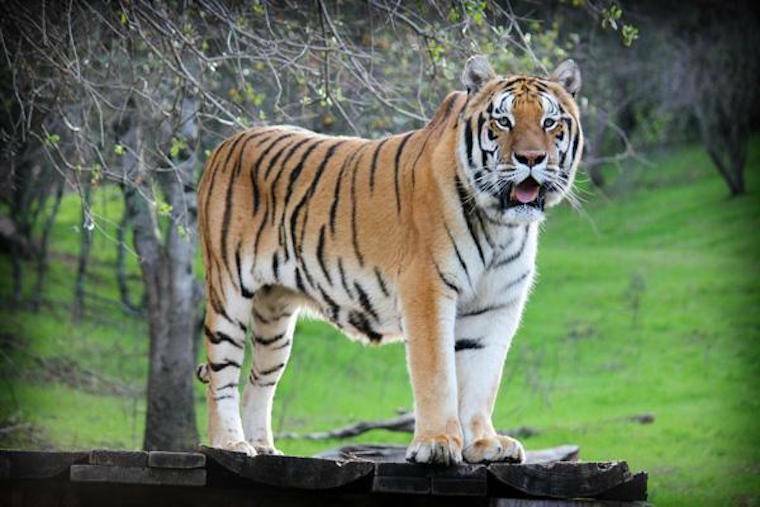 Bigelow, the largest of the three tigers, had been housed separately at the Colorado facility with a fence dividing him from his two brothers. The three are housed similarly at PAWS (as neighbors) but live in much more spacious and natural surroundings. All three tigers arrived at ARK 2000 intact (not neutered), and male hormones may have caused some of the previous scuffling and fighting reported at the other facility. Nimmo and Wilhelm were neutered by PAWS' veterinary staff in October, and Bigelow will undergo the same surgery soon. After enough time has passed for hormones to dissipate, it is possible they may be allowed access to each other, although they seem quite content and relaxed with their current housing. The tigers in this trio are often seen lying on their backs in the grass or under an oak tree, with their fluffy white bellies facing up to the sky - an image that PAWS cofounder, the late Pat Derby, always treasured as a sign of a happy tiger. Morris, a neutered 5-year-old male, and Rosemary Arnot, a 5-year-old female, share a large habitat at ARK 2000. Morris receives supplements and medications for a limp caused by a malformed shoulder that fortunately does not appear to be painful for him. He is very active and playful. Rosemary Arnot is our smallest tiger, weighing in at a "diminutive" 230 lbs. She arrived unspayed and, like Sawyer and Marin, was used to produce cubs for exploitation. Rosemary is scheduled for spay surgery and dental work soon. Both Morris and Rosemary are energetic and very active, and it is really wonderful to see these young tigers enjoy a large, naturalistic habitat where they can scratch on trees, lounge in the tall grass and playfully chase each other and run for long distances. PAWS is honored to provide a permanent, loving home for these very deserving tigers who have suffered so much hardship in the past. It was a poignant moment for all of us when they first stepped out of their transport cages and into a new life where their dignity is preserved and their inherent wildness is respected. We are enjoying getting to know their distinct personalities, and are as committed to providing for their unique individual needs as we are for all of the animals who call our sanctuaries home. We are grateful to you, our supporters, for making our work possible. Your donations will secure a bright future for the "Colorado Eight." Thank you.